Meals cost £2.25 per day and can be purchased using ParentPay. Supervision of the children during the lunchtime is undertaken by Play Leaders who are responsible to the Head of School. (If parents have any concerns about issues at lunchtime they should refer these to the Head of School and not individual Play Leaders). We provide a wealth of exciting and motivating activities at break and lunchtimes. However if children’s behaviour causes us concern we will contact parents to discuss the issue. In extreme cases the right to remain on the school premises at lunchtime may be withdrawn and in such circumstances parents will need to take their children home for lunch. A member of the teaching staff and a senior member of staff are on duty each lunchtime. Free school meals are available if your family or child are in receipt of certain benefits. If you think that your child/ren may have an entitlement to free school meals please contact the school office for an application form (or download below). There is no discrimination between those children who are entitled to free meals and those who pay. From September 2014, all children in Reception, Year 1 and Year 2 in state-funded schools in England will be eligible for free school meals. Some of these children would also be eligible under the current free school meals scheme and it is very important that we still identify these pupils. This is because each child registered under the original scheme attracts valuable funding for their school. £1,300 for each eligible primary-aged pupil will be allocated in the next school year in additional funding. We, therefore, ask that you complete the application form in order for us to identify whether you would have been entitled under the current free school meals scheme even if you do not actually wish your child to have a free school meal. Parents of pupils who already receive free school meals do not need to complete this form. Remember that every child in Reception, Year 1 and Year 2 is entitled to receive a free school meal regardless of the outcomes from this application form, but completion of the form may bring valuable funds for the school. Please be advised that the Local Authority will not confirm the outcome of your application, but should you wish to know if your child attracts additional funding, you will be able to find out by asking the school administrator from the start of July. 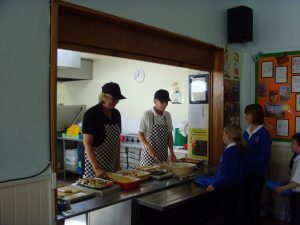 In addition to the welcome news that KS1 children will receive free school meals from September, the United Schools Federation, would like to provide one free school sweatshirt to all children registered and entitled to receive a free school meal under the original scheme, together with all children registered as ‘Service’ children. (At least one parent in the armed forces). This is our thank you for registering for this scheme and in doing so helping release extra funds to support the work of our schools. Pupils may, if parents prefer, bring a well-balanced packed lunch for the mid-day break. Containers must be clearly marked with your child’s name. All children are provided with water to drink.